For the past couple of weeks a debate has been raging on the Opposing Views website between Speaking of Research’s Dario Ringach and the anti-vivisectionist Ray Greek. It has been a debate shaped by Dr. Greek’s attempts to persuade readers to agree with his very narrow concept of what prediction means in biology and his frankly impoverished view on the role of basic research in advancing medical science, and to oblige those debating them to accept a playing field rigged to set them at a disadvantage. Judging by Dario’s most recent opinion piece and an article written a couple of days ago on the role of basic research Dr. Greek failed in this attempt. 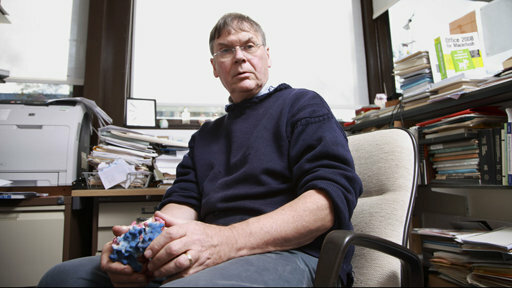 British biochemist Sir Tim Hunt, who won the Nobel Prize for medicine in 2001. Among all the discussion was one comment that directed readers to an excellent example of the value of basic research and the how study of animal models made many key discoveries possible. Earlier this week the BBC aired a program in their Beautiful Minds series featuring Sir Tim Hunt, who was awarded the Nobel Prize in 2001 for his research on how the cell cycle – through which cells grow and divide – is controlled. Sir Tim’s work focused on the role of a family of proteins known as cyclins and as the Beautiful Minds program explains the initial breakthrough came from studies of the fluctuations in the pattern of protein expression during the cell cycle in sea urchin eggs. This discovery was followed swiftly by the demonstration that cyclins were also present in yeast, clams and frogs, allowing Sir Tim and his colleagues to predict that they would have a role in regulating the cell cycle in many species, including humans, a prediction that was soon confirmed to be true (1). This program is a reminder that while discussion of animal research tends to focus on animals such as mice, rats and monkeys a lot is being learned about the fundamentals of our physiology through research on more humble model organisms, a diverse collection that includes not just sea urchins and clams but also nematode worms and flies . These animals, along with other model organisms such as yeast and bacteria, enable us to study how living things work at a very fundamental level, laying the theoretical foundations for future applied and translational research that yields innovative treatments for disease and injury. At the same time, researchers studying other aspects of physiology often require higher mammals. The study of complex brain functions, including vision, hearing, memory, attention and motor planning, as well as how these functions fail in diseases of the central nervous system, is a prime example of this. If you haven’t watched the Beautiful Minds series yet I strongly urge you to do so, the programs provide a fascinating (if not always flattering) insight into how science works. And don’t delay: they are only available to view on the BBC iPlayer for another 7 days! Posted on April 23, 2010 April 25, 2010 by EditorPosted in News, Science NewsTagged animal, Applied Research, Basic Resarch, BBC, Beautiful Minds, brain, cell cycle, clam, cyclin, dario ringach, frog, neuroscience, nobel prize, paul browne, Ray Greek, sea urchin, Sir Tim Hunt, translational research, yeast. Previous Previous post: April 2010 Rally – The Video! Those of you who watched the documentary about Sir Tim hunt will have noticed that in the last 10 minutes the discussion turned to understanding the biological processes that occur in cancer, and how developing effective treatments for cancer is a more difficult proposition than sending humans to the moon (and getting them back safely). Orac’s post shows exactly wwhy when people ask “Why have scientists not found a cure for cancer?” they are spouting nonsense.